Troll - n, One who posts a deliberately provocative message to a newsgroup ormessage board with the intention of causing maximum disruption and argument. Or, at least according to Urban Dictionary, which I'd say is a reliable source in these kind of matters. I'm off to vBarre in about five minutes but I wanted to spend at least one of those sharing my two cents on blog trolls. I'm not even going to take the time to break down the troll's email or defend my blog or my opinions. And the reason for that is, that I don't feel I have to. That is one of the most beautiful things about blogging. Unlike Facebook or other social networking sites, no one is forced to read a blog. My thoughts and opinions do not flood your news feed (unless you've made the choice to be FB friends). Reading a blog is a conscious choice, where you must click onto the site and can click off at any time if you don't like what I have to say. America is a beautiful country where we have the privilege of free speech, a privilege so many other people don't have. It is truly a miraculous thing to be able to say and write whatever you think whenever you want. Its a privilege I'm proud of and grateful for and will continue to exercise whenever I choose to. I'm so grateful for the friendships and connections I've made with many of you through blogging. With the risk of sounding cheesy, I'll say it was one of the things that helped me most when relocating to New Jersey from South Carolina and I am grateful for the network of women I have to connect with on a daily basis. I love sharing stories with you and reading your thoughts and opinions on life, love, and whatever you choose to write about. On my blog, I enjoy having the freedom to post my own thoughts and opinions about life, love, and whatever I feel like writing about. I don't always agree with every opinion I read on a blog. But I will always be positive in my comments and friendly to other bloggers. And if I ever do come across a blog where I read something that really, truly bothers me, I am confident that I will respect the rights all of you have for free speech and just click the little red "X" at the top of the screen and move on to the next one. It is my personal opinion, that people who attack other people and their rights are generally unhappy with themselves. But that is a whole different discussion. So, what it all boils down to is take the advice my Mama gave me all through my childhood and the advice I try to share with my students each day. "If you don't have anything nice to say, don't say anything at all." Leaving an unkind comment that attacks me or my opinions isn't going to ruin my day and it won't make me change what I write. If your opinion differs from mine or we don't have the same sense of humor, just click the red "X." Reading a blog is always a choice and negative comments simply aren't welcome here. For those of you that have been so positive and kind over the past 14 months of blogging, thank you. I like to think of my blog as a positive place for me to connect with women that I have things in common with. 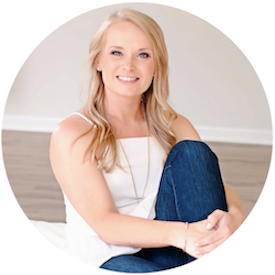 Its a place to make new friends and share ideas, stories about life and my little family, and of course chat about hair styling, shoes, and my favorite shades of Essie polish. And that is my two cents on trolls. You're regularly scheduled Life with Elizabeth Posts will commence tomorrow morning with an extra special Bridal Talk Tuesday! i completely agree with your opinion on these trolls. im slightly shocked that someone would exhaust a bunch of their time to write that! Good for you! I always feel like if you don't like what you're reading, then that's what that handy little x In the corner of the screen is for!! That's so rude that someone wrote that! Clearly they don't know what they're talking about. Wow! I went back to read the post again to see if I really missed something the first time...and that person is absolutely crazy! You said nothing wrong or mean and these opinions have absolutely no validity! I think you have a good perspective on this. Not to mention this is YOUR blog, and if you wanted to you could curse and talk trash about people all you want...because it is a free country and you have free speech. Obviously you are not that type of person, but regardless...your blog, your thoughts! Click the X in the corner if you don't like it! Oops! 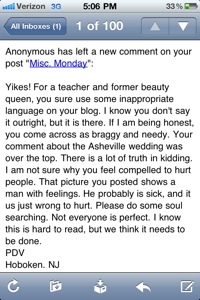 I thought that the comment was on yesterdays post, but obviously not since it wasn't about Asheville! Anyway, I have never read anything mean or hurtful on this blog and that person is just a troll! Sorry you had a mean comment! Rude! I have been following your blog for a little while now and I must say I have never found it to be inappropriate in any way. haha they have obvi. never read my blog! Sorry you had such a rude email and they didn't even sign their full name. This your blog and you have the right to say whatever you want! If it bothers someone, they shouldn't read it! How rude! Eww...who is this person? Why do people waste thier time with such negativity?!?! completely baffling!